Why are ronchis sometimes blurry slitless? i've noticed that all my slitless ronchis are blurry towards the sides outside ROC and completely blurry inside. Anyone know why this is? 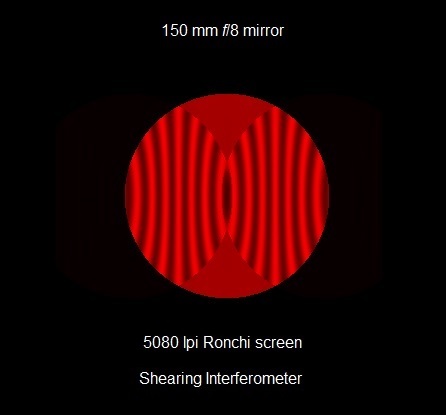 The Ronchi acts as a Lateral Shearing Interferometer, with the shear in the direction perpendicular to the ruling. The finer the ruling, the more the shear. So that will make the edge of the mirror (and everything else) appear smeared/convolved in that direction. PS: This also explains why e.g. "correction" (which is spherical aberration as seen from the Ronchi's COC location) looks like traditional TWG coma fringes ... because sheared spherical indeed IS coma. BTW, in that sense, Ronchi is desensitized relative to traditional interferometry by the shear fraction (shear/diam). This is why most labs have at least one Zygo or other such in their test room. 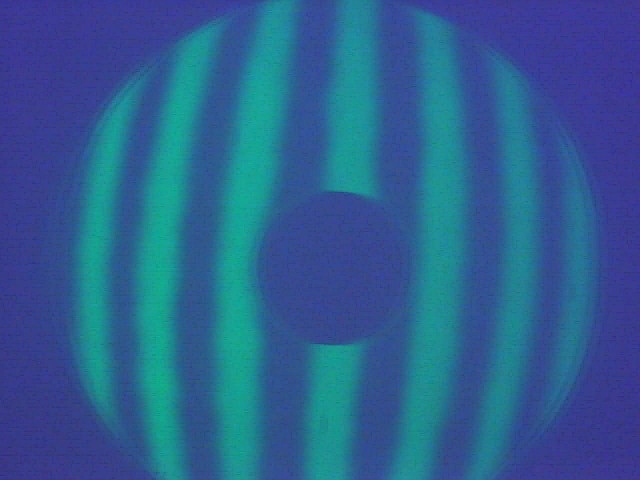 The beauty of Ronchi is that the geometrical optics analysis and the full wave-optics predictions give nearly the same answers, with the wave optics (of course) explaining the subtle shading and ringing effects, as well. Anyway, I think what you may be describing is that coherent shear manifestation. I think he wants to know if its an indication of correction error...if its blurry on inside RoC does that mean the focus is too long, making the inside bands more blurry. I would not try to read into it like that. Edited by Pinbout, 21 January 2019 - 08:52 AM. What's the frequency of your screen, i.e. lines/inch or lines/mm? And what did you test with it? The Ronchi test is both geometric and interferometric. At lower frquencies (coarser screen), it's almost purely geometric (i.e. the bands are shadows). At very high frequencies, it's a shearing interferometer, and the bands are interference fringes). The former is qualitative; the latter quantitative. If the rulings are sufficiently coarse there will no no significant interference between the rulings. A rule of thumb that gives very clean ronchigrams is 6 times the focal ratio. That's where edge diffraction just becomes noticeable. Thus for an f/8, a Ronchi screen with 48 lpi should provide perfectly clean bands all the way to the edge. Higher frequencies begin to give misleading edge appearance. Notice how the edge gets worse with higher frequencies, and mimics a turned edge error. If one is to use higher frequencies, then it's best to use a very high frequency Ronchi screen as a shearing interferometer. The interference fringes are tack sharp to the edge, and the test is quantitative. I get the same result using glass Ronchi's. Inside of focus is fuzzy and indistinct, but outside is crisp and clear, with film Ronchi's it's a little better inside. With glass be sure you have the grating surface towards the mirror. It always is, I think that's why inside images are so fuzzy, maybe I will try it with the Ronchi inverted. "and the bands are interference fringes..."
Sorry Mladen, I wish this was true, since we have been seeing "eye to eye" the last few years. I have been somewhat spoiled recently, having access to 2 IF's that can measure the radius to 1/10th micron, and wave ratings to whatever one can dream up, with the proper software. In no way, is "Raunchy" a truely acurate representation, or to be considered an equivalent, of a higher class IF. Even to have a coached few jobs and training, it's stupendously amazing what you could do with metrology related to a true IF. I can't stress this enough. I think I have been blessed to see this difference. Oh god, are we back to "Ronchi bands are interference fringes?" Somebody please put that horse out of its misery. Ronchi is good for quick and dirty evaluation, and it will show you overall curve. Strange I don't see these "fuzzy lines" maybe it's due to using a 50 micron pinhole for the source so far. A slitless source makes no sense for Ronchi, but a large (3-5mm) source works fine. Could be what looks blurry is the changing appearance of the diffraction fringes at the various distances from actual zonal ROC that is evident when looking at a strong asphere with Ronchi. Here's what a fast mirror (f/3.57) looks like under 133 LPI Ronchi, 50micron source. Note the fine detail - all of which is predicted by the theoretical simulation as well. Some of it is due to that source not matching the spacing of the grating, but it gets the job done nevertheless. Edited by mark cowan, 21 January 2019 - 06:42 PM. Edited by Pinbout, 21 January 2019 - 06:51 PM. Mark, I am not disagreeing with you. If you read closely I never said a Ronchi test using high frequency grating is a higher class IF. Not all interferometers are the same, but all interferometers have one thing in common: the separation between fringes is a multiple of a wavlength and the results are quantifiable. This makes any interference pattern quantifiable. 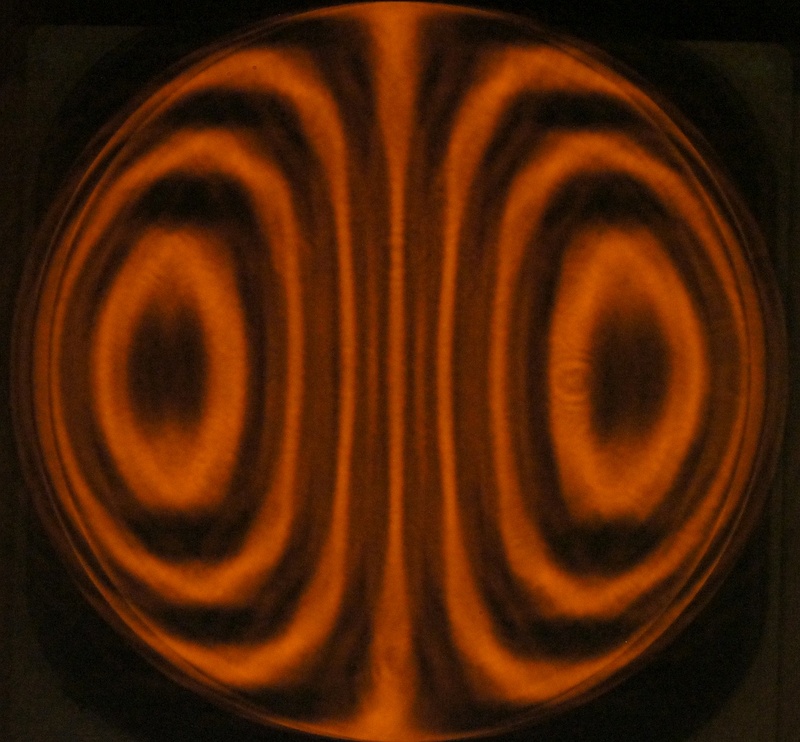 The Ronchi test is both geometric and interferometric. The difference is in the ruling frequency and order overlaps. In lower frequencies it's geometric; in higher interferometric. Daniel Malacara's book Optical Shop Testing has a lengthy chapter on the theoretical aspects of both. And there's no doubt that the professional optical community recognizes that as true. Here's an illustration from Malacara's book which can be found in PDF format online. All one has to do is search for Ronchi test interferometer online and you'll find numerous articles in American Optics and similar professional magazines and books on the this topic. 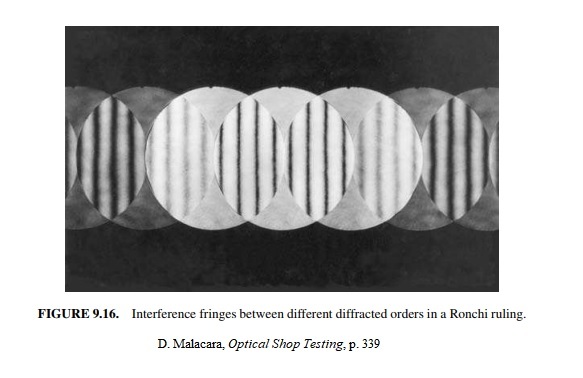 A recently published book intended for ATM readership by William Zmek (Interferometry for Amateur Telescope Makers) also has a whole chapter dedicated to the Ronchi test used as an interferometer, and an image (page 123) similar to my example. As to the accuracy of such an interfometer, you know very well, there are many ways to evaluate a ronchigram. Not so long ago, the only way was to manually measure distances between fringes and extrapolate the value. It's a far cry of what you have at work, but it's much better than a qualitative guess of ordinary Ronchi tests used by most ATMs with relatively low frequency screens. Manual fringe analysis described in Ingalls's ATM books shows that it cna be done to 1/10 wave PV wavefront, if not better. It may not be close to modern Zygo's working at 1/50 wave PV wavefront accuracy, but it's not bad either if we consider that very little improvement will be gained by making a mirror better than 1/10 wave PV wavefront. Edited by MKV, 21 January 2019 - 08:09 PM. I never look at that. Besides he said "blurry towards the sides outside ROC"
"a qualitative guess of ordinary Ronchi tests used by most ATMs with relatively low frequency screens." Well yes, this is the problem. Almost always, the most frequent grids used here are either 100, or 133. "At lower frequencies (coarser screen), it's almost purely geometric (i.e. the bands are shadows). At very high frequencies, it's a shearing interferometer, and the bands are interference fringes). The former is qualitative; the latter quantitative." Maybe I left something out. Edited by MKV, 22 January 2019 - 11:31 AM. This is a commercial production. What for is it given to the client? Because they aren't aware of 2 things. 2. Clueless to the relative value of numbers. "What for is it given to the client?" The link shows the supporting structure; has nothing to do with the actual glass fabrication. Ronchi’s are qualitative- showing nice polish and no zones or tde. That’s why a maker would give the image. The no-mask Foucault test does the same and is more sensitive. Edited by scopemankit, 24 January 2019 - 10:34 AM. The Foucault does more than that, Danny. It also shows if the edge is intact or turned, as well as surface finish, and then some. but it doesn't elude to the quality of correction, where a ronchi can.